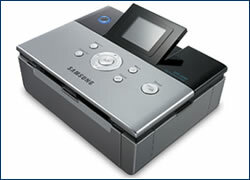 The SPP-2020/2040 are Samsung’s newest office ware additions – a dye sublimation A6 photo printer that users will love for its compact size, as well as its convenient PC-less editing functions. The SPP-2040 series features a 7-in-1 memory interface, and supports direct printing connectivity with PictBridgeTM for digital cameras, camera phones, and digital camcorders. Available as both a wireless (Bluetooth) and wired printer, the SPP-2040 boasts great quality and fast operation. 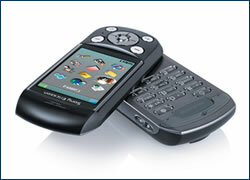 Sony Ericsson’s new S710a sports an elegant, rotating design, support for high speed data networks, and a powerful 1.3-megapixel integrated camera. Add these to a jumbo screen, Bluetooth, and support for expandable memory, and you’ve got one serious contender in the high-end handset arena. While photos are obviously the focus, other forms of entertainment – like games and a basic MP3-playing application – will attract target users. Price: CZK 14,500.